The primary aim of the "Quaderno per il recupero energetico" (Workbook for energy recovery) is to make available to designers the intervention techniques collected and elaborated during the European project AlpHouse, to create an easy-to-consult, dynamic and updatable tool, which can give a support to the design and realisation of the energy-saving recovery measures for traditional buildings. It is a publication that represents the synthesis of the research and the experiences carried out in the Valle d'Aosta during the AlpHouse project. The European project, funded by the European Territorial Cooperation Programme "Alpine Space" 2007-2013, offered the Valle d'Aosta the opportunity of living a great experience, made up of moments of thorough research on the territory and on the local architecture and important opportunities for transnational know-how exchange. 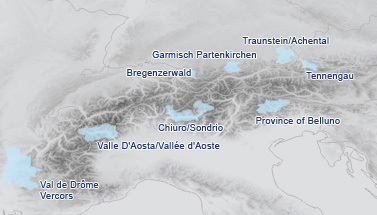 The most important result of the AlpHouse project was the creation of a new approach aimed at introducing the complexity of the issues related to the sustainable renovation of the existing architectural heritage into the construction process, in order to provide new tools and knowledge practically applicable in alpine regions. The "Quaderno per il recupero energetico" (Workbook for energy recovery), was developed at the end of the project by COA energia Finaosta and the Department of Production Activities of the Autonomous Region of Valle d'Aosta (regional partner of the AlpHouse project). From the beginning of the project, in fact, in order to achieve the objective of combining the themes of energy saving and quality of living with the protection of historical heritage and strengthening of local economies, the need to analyse in depth the territory and its needs was identified; it has always been considered important to create dialogue between professionals and all the actors involved in the building process, gathering experiences at regional and transnational level is useful to define good practices that integrate conservation and energy optimisation. Considering the speed that characterises technological, economic and regulatory evolution at European, national and regional level, it is important to be able to update the technical tools related to it: the publication has, therefore, been designed as a "ring binder", to allow the integration of the contents of this edition with future updates or other notes and examples derived from the training sessions or the practical experiences of the professionals. The "Quaderno" consists of three sections. The first section, introductory, starting from some considerations on the regional architectural heritage and its evolution, illustrates the approach methodology proposed to integrate the conservation and the energy optimization of existing buildings, taken to the AlpHouse approach. In particular, this methodology would be a reference for the energy renovation interventions of traditional buildings where, often, the re-use of the spaces implies a change in the intended use (in many cases, from rural to residential) and needs a re-design and an adaptation of the traditional building construction elements. The second section consists of a collection of "cards" which analyse the traditional building elements, from the point of view of the conservation and the thermal and moisture performance, at the state of fact and following the energy optimization measures. The structural elements selected and the proposed interventions are taken from real cases analysed in buildings identified during the pilot project AlpHouse, thanks to the availability of designers, owners and SMEs. The third section describes a set of solutions relating to the constructive nodes, the points which are, generally, more critical from the thermal, technological and executive point of view. Starting from the different construction elements analyzed in the second section, have been identified several technical constructive solutions, at the state of fact and after the energy renovation, evaluating the effectiveness of the solutions in terms of energy and indoor comfort, respecting the issues related to the protection of the building and the other regulations. The interventions were examined and reported on a detailed scale, are accompanied by technical instructions that describe and summarize the most significant aspects from the point of view of heat and moisture. The aim of the publication is to bring out the coherence between the cultural and methodological premises of the energy renovation and the application aspects related to it, emphasizing the complexity of a conscious design process and realisation. The contents arise, therefore, as a collection of best practices that can't be applied without critical analysis, but that allows technicians to conduct in-depth reasoning about the intervention strategies for optimizing the energy efficiency of traditional buildings. The publication (now available only in italian language) can be asked by filling out the form downloadable from the website: www.regione.vda.it/energia/alphouse or by contacting the Infoenergia Chez Nous office 23, Conseil des Commis Avenue - 11100 Aosta – IT - (for more information: tel. (0039) 800604110 - e-mail: infoenergia@regione.vda.it).